The dinner was quite light on meat** and included both traditional American and Indian foods. As I said last night on the twitter feed: Anyone who serves naan and cornbread in the same meal has my approval. *Prime Minster Singh comes from the Indian National Congress which formed a coalition government with several other Indian parties rule the country. Indian party politics are very complex, though in some ways it could be argued a complex multiparty system is more responsive to the wishes of voters than the two party system we have here in the US (I’m waiting for a program to run and have too much time to think). What is it about purple plants? I’m really at a loss here, but there’s just something way cooler about eating a purple colored plant over a more regular color. I’m not sure what it is (I’m not particularly partial to the color purple in other contexts). Could we feed ourselves with tomatoes? Obviously no one is suggesting turning the US into a tomato monoculture, but tomatoes seem like a easy, if not necessarily accurate, proxy for the sort of fresh vegetable passed diets that some people advocate as a solution for the entire nation. If the did the same calculation for lettuce, the numbers would likely be much worse. If I did it for sweet potatoes, I’m guessing they would be substantially better. Today 1 in 8 Americans and 1 in 4 children is on food stamps. We have some of the most productive agriculture in the world, which translates into some of the lowest food prices. Any change that decreases our productivity is going to have to include some way to protect those who already don’t have enough to eat. Get government funding to train people in how to cook simple meals (things with lots of rice, dried beans, and pasta) and even buy hot plates and a few pots and pans for those most in need. The cost of homemade rice and bean burritos is a lot less frozen food and potato chips. Some people still won’t have time to put together their own meals, but for some, such training and equipment could make a HUGE difference. I got thinking about this after seeing this cool/frightening graphic from the nytimes about the huge increase in food stamp usage in this country. In recognitions of the huge feasts many of us are or soon will be sitting down to, let us take a moment to think about the very fact that vast range of different foods human beings can eat might be the very reason we out competed other hominids (specifically neaderthals) with more specialized diets. Our ability and willingness to eat almost anything may have been the crucial edge we needed. Picture a small, warm valley in Northern Europe that supported enough deer, wild cattle and sheep to support a band of neanderthals. If they reproduced too much (or another band of neanderthals moved in), the now-unsustainable harvest of prey would force them to disperse to better hunting grounds, and in time, with relaxed predation, the prey would likely repopulate the valley. But if a band of humans moved in, they may not only help over-harvest the big game, but also refuse to leave when the game ran out. Maybe there’s still good year-round living to be made on rabbits, seeds, fish, grubs and berries. And while they’re out gathering, they’d certainly help themselves to any of the (now rare) big game that they came across. Read more in MAT Kinase’s exciting post on the subject over at The Scientist Gardener. In addition to the many other things I am grateful for, from my amazing family, to being able to work on such interesting science surrounded by such wonderful fellow researchers, and all the many other things that aren’t of any interest if you don’t know me personally, I am grateful for a digestive system that can handle fungus and the milk produced by other species to feed their own young, and insects, and grains, and fruits, and vegetables (including some vegetables that are just glorified leaves), and, of course, delicious turkey. Edit: I’m also very thankful for readers of this site, and the fellow authors I’ve discovered through my writing here, too numerous to name. It’s good to know I’m not alone in my attempt to bring the public and science back together. Edit 2: I also just realized this is my 250th post in 22 months writing on this site! 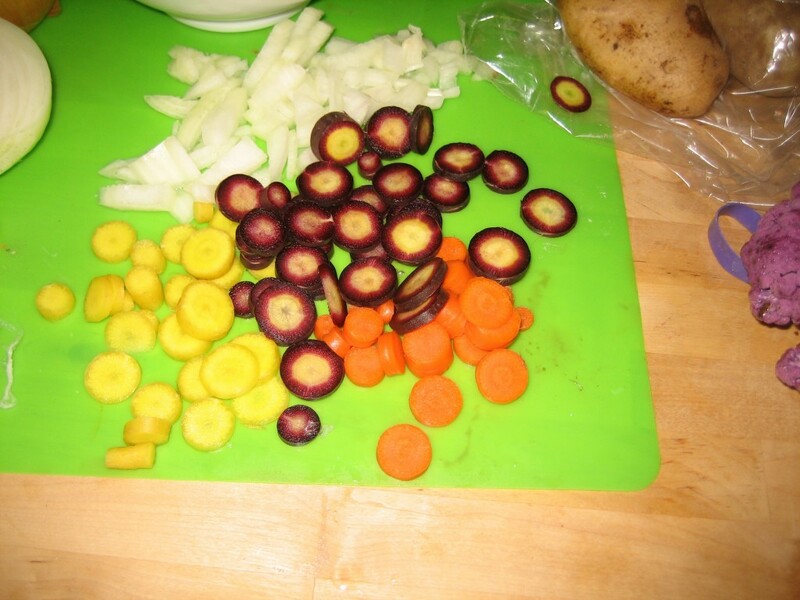 Yellow, orange, and purple carrots. Chopped onions too. 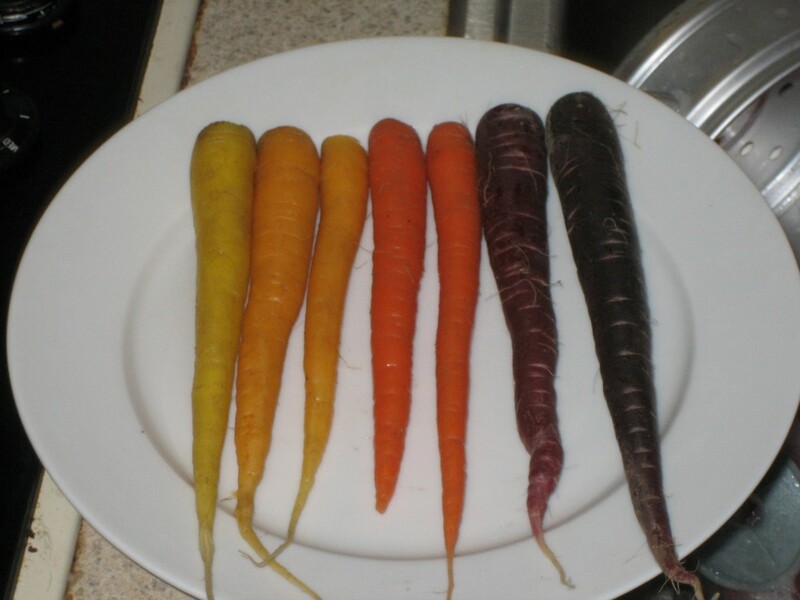 Notice how the purple carrots are still white in the centers? I want to know more about why! Hear one of the lead authors of the maize genome paper explain how and why it was done in under four minutes. Reviewing the quality of the genome sequence itself. We can already see research made possible by the maize genome. Read about how the maize genome project is helping researchers find more genes selected for during the domestication of maize.